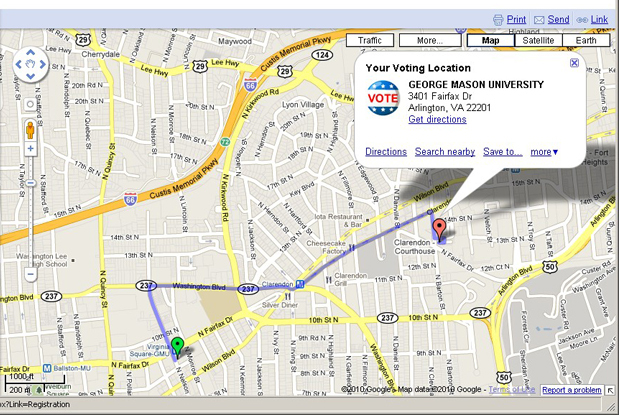 Incorrect poll location information used by Google’s poll finder tool caused major disruptions to voters on Tuesday. Here are a few stories. Yesterday we reported that one of our editors was directed to an incorrect polling site using the Google elections tool, and that a company called Aristotle had conducted a study suggesting that potentially a million or more people were directed to the wrong place. Today, firsthand accounts are trickling in from readers about Google-related polling confusion. Charlie Fitzpatrick, newly of Arlington, Virginia, is a good citizen and checked his polling site days in advance. Formerly a social studies teacher whose old school had been his previous polling site, he anticipated that his new polling place would also be at a nearby school, and when he checked the Virginia voting registration website, it forwarded him to an MSN map that confirmed his hunch–he would only have to walk a block or two up the road. Yesterday morning, he listened to a radio report talking about Google’s new easy way of finding your polling site. Fitzpatrick, who works for a geographic information systems software company, is interested in maps and voting behavior, so he tested it out. He Googled, “Where do I vote in Virginia,” and a Google link came up. He clicked it–and it directed him to the wrong site, over a mile away. weird little fluke rather than some deep, dark conspiracy,” he goes on. 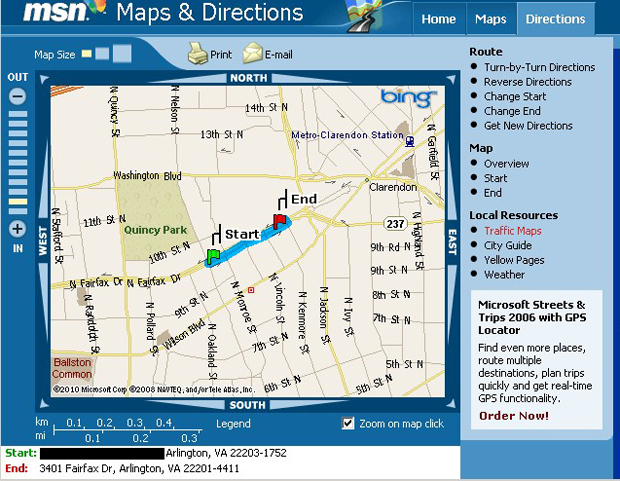 In our own editor’s experience, he was given both a different address and a different map by the Google tool. Left to gamble on which was correct, his wife went first to the address provided by New York’s Board of Elections website, across the street from his apartment (rather than the Google-recommended site six blocks away). She texted him that it was, indeed, the correct site later that morning. Some have suggested that the Voter Information Project, which provided data used by Google for its tool, updated polling place locations since Google originally started pulling the addresses for its tool. But regardless of whether errors were as prevalent as voter data company Aristotle has suggested, addresses provided by both Google and the Voter Information Project‘s SMS service were incorrect on election day. Google still has an incorrect polling place for an address on its own blog entry touting the easy-to-use polling place finder, as blogger Gary Price pointed out yesterday on his site, Resource Shelf. That address? 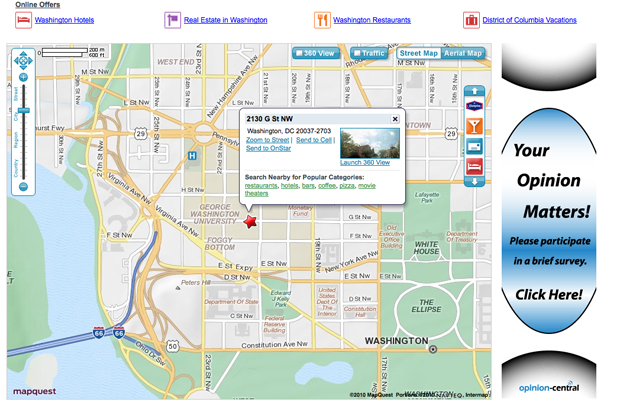 1600 Pennsylvania Ave. NW. The White House. 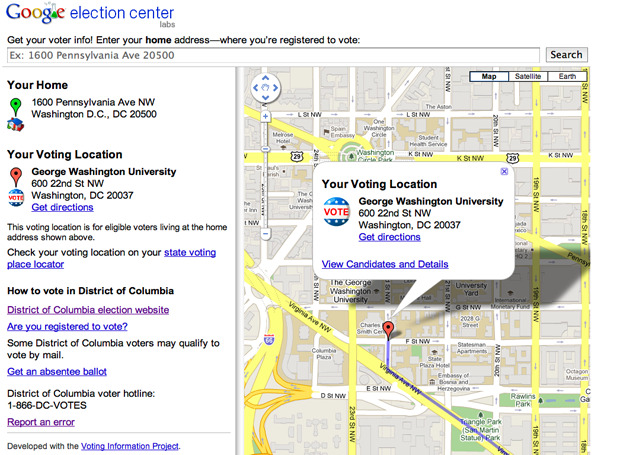 Here’s the polling place mapped by the D.C. Board of Elections website. razor-thin margins or still hanging in the balance illustrate this point. Tyler Gray contributed to this report.